If you have an informal query or wish to convey your views about the EASTBIO programme to the Management Group, you may prefer to contact directly your local student representatives - first year students who have generously volunteered to represent their local constituencies. The current EASTBIO student representatives, from the first-year cohort, are assisted in their roles by the second-year representatives (as well as the EASTBIO DTP Administrator) during their first year. Click on the name to send an email any of the student reps! Hi! 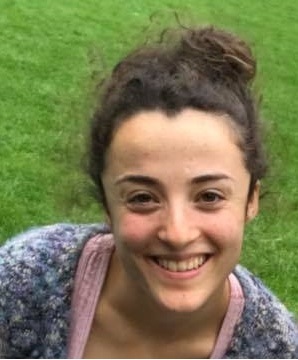 I am Ana Rozman, a PhD student at the University of Aberdeen, School of Psychology. My project is based in studies of human visual perception, looking at how the human visual system ages, specifically in terms of colour appearance. As a result of biological aging, multiple physiological changes are occurring throughout the visual system, predicting there should be a difference in how colour appears throughout lifespan. Those changes are, however, present to a lesser extent than expected. My aim is to improve the understanding of compensatory neural colour mechanisms, using a combination of psychophysical and electroencephalography (EEG) methods. Before starting my PhD, I have completed a BA Hons in Film and Media with Psychology at the University of Stirling. When not at my PhD desk, I am preferably travelling, meeting new people and watching loads of good films. Hello! I’m a PhD student at the University of Aberdeen based in the School of Biological Sciences. My project focuses on the bite site that the Varroa mite creates on the honey bee. I’ll be investigating the immune response and deformed wing virus titres in that area. I’ll also be working with colleagues at the Institute of Medical Sciences in order to look at changes in local histology. Not only will I be learning lots of new techniques in the lab but in order to collect honey bee and Varroa samples I will have to become a beekeeper! Before starting my PhD I completed my undergraduate in Zoology with Microbiology at Aberystwyth University and then my MSc in Biomedical Science at the University of Chester. When I’m not working I like to spend time outside trying to spot different kinds of wildlife, working on little craft projects and dancing. I have joined Alistair McCormick’s lab at the University of Edinburgh. Here, I will be developing a low-cost imaging method to automatically track plant growth. This could be used by farmers of all backgrounds to monitor their crops and improve yields. My background is largely biochemical having studied a BA in Natural Sciences followed by an MSci in Biochemistry at the University of Cambridge. My current project will combine molecular and physiological work with computation which I am looking forward to. When I’m not in the lab I enjoy climbing, acrobatics and pole dancing which I do both competitively and for fun. Now that I am in a new city I am keen to find some new activities to try! For details of our second-year student reps, click here.